Enrollment for classes is now open. If you enroll for classes by Jan. 11, you will receive a $10 discount off your tuition. Be sure to register as soon as possible as some classes fill early. Classes begin Monday, Jan. 25. Kindermusik and Music for Little Mozarts (keyboard) classes are open to children ages birth - 6 years old. Class descriptions, class times and locations, registration information are all available online. Not sure how your baby or child will do in a class setting? Try a Free Kindermusik Demo Day class (Jan. 9-16). If you enroll for spring classes at a Demo Day, you can receive a discount. RSVP required. 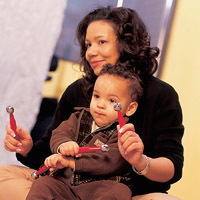 For more information call 314-968-5939 or visit www.webster.edu/kindermusik. The Kindermusik Academy is recognized by Kindermusik International as a Kindermusik Maestro, Mezzanine Level for 2015-16. The Mezzanine Level Maestros represent the top 5 percent of Kindermusik educators in their class for building a truly expansive program and proving masterful in reaching a large number of families.